Good morning Canadians and everyone else in our SFG Forum across the World. Our thoughts go out to all our gardeners who are facing floods, drought, and Mother Nature herself. In Canada, we are such a large landmass, that like our friends to the south, we are experiencing both extremes at the same time. It is a pity that it cannot be evened out. Where I am in British Columbia we have had only a small few millimetres of rain since late June so we have to resort to regular watering for all that time. Next year our local town goes on to metered watering so it will be interesting to see if the profligate waterers will be charged more or the frugal ones, like myself, will benefit. I am think especially of two of my neighbours who water nearly everyday and have water running down the road for hours at a time. I would love to see their water usage on their utility bills. Mine is listed at about 1/4 of the average household but then I live alone and the cat doesn't use much water. My main task at the moment is to keep up with the bounty that my small apple tree is providing this year. I have tried picking as many apples as I can but some are out of reach in spite of taking off many branches last year. The bears have been around all year as they are having a hard time in the mountains with the lack of moisture and so many areas burning. Another thing that makes me sad is seeing the amount of huckleberries that have been on sale in our local markets. Piles and piles of them. Why does seeing the piles of huckleberries make you sad? I'm envious of your apple bounty. I'd have a field day harvesting, pressing and then fermenting them! Here in New Brunswick, it's a overcast day, but the Sun is fighting for dominance of the skies, though that doesn't rule out sporadic rain. The expected high today is 16. To think in only a month or two, I'll be begging for 16 degree days. @SwampTroll wrote: Why does seeing the piles of huckleberries make you sad? Sorry, Swamptroll, I did not finish my post by giving my reason. The reason being that huckleberries are a major source of food and the bears need them more than we do. I think it is OK picking a few for yourself, but this seems to be done on a commercial scale. @Kelejan wrote: . . . the cat doesn't use much water. . . Thank you for the chuckle! This is a pic of an incredibly large dahlia that I grew in one of my SFGs. 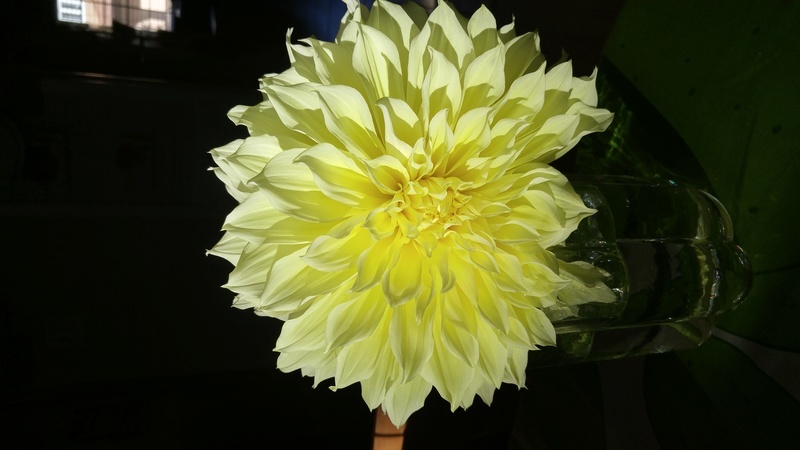 @Mimi2 wrote: This is a pic of an incredibly large dahlia that I grew in one of my SFGs. Aw Mimi, it's so beautiful! Do you remove the roots and store them for the winter? @CapeCoddess wrote: Aw Mimi, it's so beautiful! 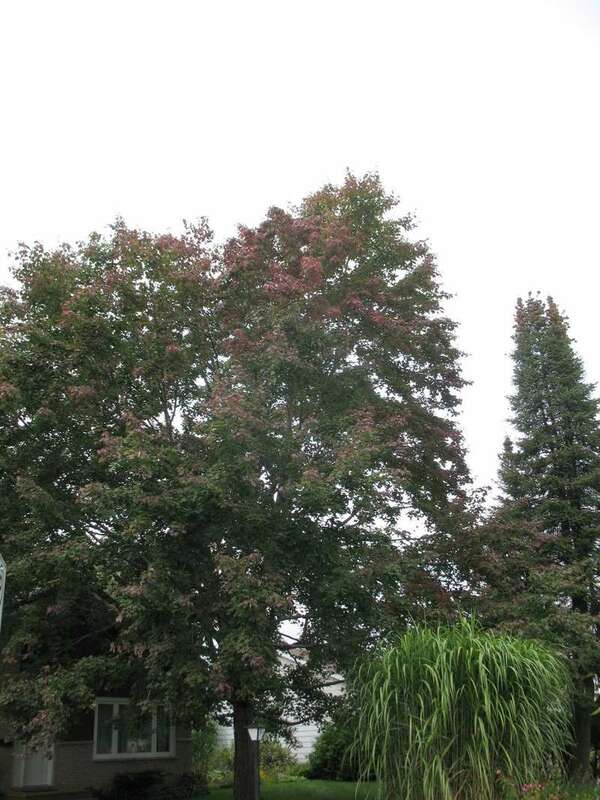 Do you remove the roots and store them for the winter? Hi Cape Coddess. In my area, I do need to dig up and store the roots or they will freeze and the plant will die. I actually did leave them in the ground one year and that's what happened. Now I give my dahlias all the TLC they need by bringing them in. Last year I put them in a bowl with peat moss and sprayed them every once in a while. And then I replanted them in the spring. Not sure if the spraying and peat moss is necessary. My old neighbours just used to out them in plastic bags in a cool place. I think I may try to put them in pots in March or so next year to get earlier flowers. And then transplant the plants. I was very excited to see that my compost was steaming when I went to get some dirt from the bottom of my bin. It was warm. Guess I must be doing something right. It has had a bit of a bad smell lately- so I thought I'd messed up. But it is magically tranforming into the right stuff- and even producing heat. Yippee! PS It takes so much kitchen scraps and leaves just to fill up one bin. I don't know how TD and others are able to generate such large quantities. Mimi, Beautiful flower. Regarding generating enough material for a compost pile: sometimes one has to go out to find more material. Stables for horse manure, grocery stores or farmer markets for culls, neighbors' leaves, buying a bale of bedding straw to mow for more browns, seaweed or kelp for those who live by an ocean, etc. 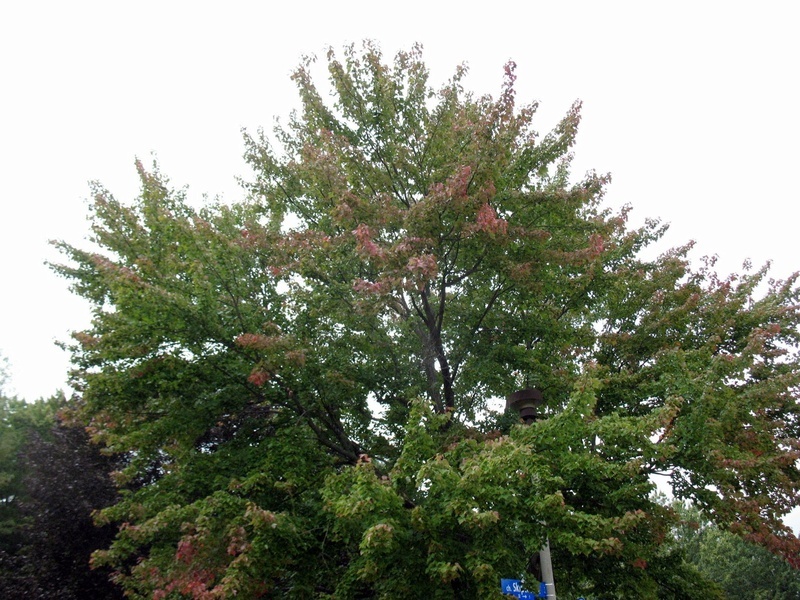 Just took a walk around the neighbourhood and saw several trees that have leaves starting to change colour. It was a pleasure to wake up this morning to find clear blue skies and no smoke. It has been a bit depressing for some time, with the world seeming to have a monochrome yellow/grey tinge. Today my eyes were not feeling irritated and I was able to breathe deeply without thinking of the damage to my lungs. It surprised me to see so many young people jogging recently, without thinking of the harm they may be doing to their lungs. During the night we had quite a downpour of rain, all of 5mm but iy did clear the air, and the forecast for tomorrow is clear skies and sun. More rain later this week. Today I have found a new way of SFG. Square-foot Step Gardening. As I collected Guthrie for his evening walk, his little companion, four-year old Sawyer, had been building a garden on the steps of her house. She does not realise that in the morning it will be gone. Hopefully she will not miss it. I seem to have lost Canadian Region September 2017. Has anyone seen it? Tonight it is raining, just a bit, and I am so glad that I managed to mow my lawns yesterday and today and get some cleaning up of weeds etc. The forecast is 30/40/60% of rain for the rest of the six days on the weather chart. I expect my golden lawn will soon turn to green. It is surprising how patchy the gold and the green is. Some went gold early on and some of it remained green all the time. I expect it is due to the underlying rocks with many near the surface which is why SFG is such a boon. I hope some one can find our September thread and transfer this post. @Kelejan wrote: I seem to have lost Canadian Region September 2017. Has anyone seen it? KJ ... the original thread was under SFG Talk - General Discussion. I've moved it to its proper location under Canada and transferred your post to it. It should be OK now. Thanks, TD. What would we do without you? Well, today the sun is shining and I am off outside to get some yard work done. the forecast is still more rain for tonight. Managing to mow my grass and doing some pruning. I found some tulip bulbs from last year that still seem nice and solid so I hope to get them planted today or tomorrow as the weather is supposed to be very pleasant. Soon be time to gather leaves from my neighbours and later this month we have a city collection of garden waste for the city compost piles. During the year we are able to collect two bags of finished compost in the spring and another two later on as the compost gets finished. I see that you are getting a lot of hot weather, TD and that some people are getting fed up with it. Has it affected you in any way? Our bears are still around, I don't think they have ever left us this year as I think they are very hungry and need to stock up their fat supply to be able to last the winter. Watch out for those bears KJ. Definitely been hot and humid here. I'm not complaining since the early part of summer was terrible. The heat will end later today as there is a cold front approaching and we will be getting a severe thunderstorm to kick off the cooler weather.